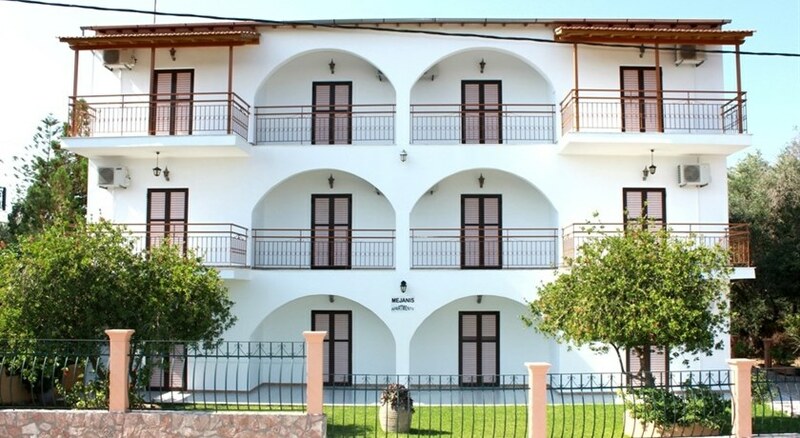 The Mejanis Studios have an excellent location in Kavos, Corfu, and are the perfect base from which to explore the local area or the island as a whole. Naturally, when on holiday in Corfu the beach is an essential part and at Mejanis Studios you’ll be no more than five minutes away from the beautiful blue Ionian Sea, with plenty of other attractions not far away. The Studios have fantastic views overlooking the garden, with the rolling mountains in the background and if you have decided to rent a car on the island there is free parking available here. With a fridge, cooking equipment such as a hob, and a dining area included in all the apartments at Mejanis Studios this is an ideal place to stay to get away from it all and have the holiday you want. The apartments have their own kitchenettes, with cooking rings, and refrigerator and their own dining areas and bathrooms. Each one of the 12 apartments has a balcony or terrace overlooking the complex’s garden. Guests have access to the neighbouring hotel’s swimming pool and the tennis courts. 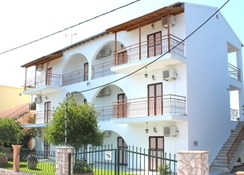 There are a number of shops within walking distance to buy groceries as well as a selection of restaurants, tavernas and bars in the centre of town. The Right Choice: The Mejanis Studios are a great choice for couples and families looking for a relaxing, self-catered holiday on the beautiful island of Corfu filled with sun, sea and sand. Groups looking for a welcoming and relaxed atmosphere with easy access to the beach will also enjoy staying at the Mejanis Studios. Each of the 12 self-catered apartments has their own kitchenette area with cooking rings, kettle and fridge, a private bathroom with WC and shower. All of the apartments have their own private balcony or terrace overlooking the garden, certain other amenities may be payable locally. The town of Kavos is located on the southern tip of the island of Corfu in the Ionian Sea, around 50 kilometres from the airport. The Mejanis Studios are positioned 300 metres from the centre of the town with its shops, bars and restaurants and only a five minute walk from the sandy beach and clear blue waters that surround the island.